I am a very lucky Miss Dotty. On those grumpy days I will often write a gratitude list to show that actually life isn’t that bad. And little things happen that make me think how lucky I am. There are some people that keep a gratitude journal daily and I think that is such a positive way to go and something I would love to try. But on to the purpose of this post. Today I want to show my gratitude and thanks to people over the past few weeks. As some of you who follow me on Twitter may know just before Christmas my lovely Micra was written off as someone drove into the back of my car. I was parked at a red light and they just didn’t stop. I was shaken up and fine and my first thoughts were that the car was a little dented but looked like it would be fixable. So I put a claim in and my insurance company came to do an assessment of the car. A few days later I hadn’t heard anything so I gave them a ring and was told my car had been written off! Thanks for telling me lovelies! To cut a long story short it took weeks and the money I got for my car was not very much. During that time I was very grateful to my wonderful school who were amazingly supportive and my colleague H and Mr Dotty who gave me lifts to work when the hire car went back. But getting a new car meant I had to make some cutbacks money wise so I had to pull in the purse strings and save some money where I could. And here comes my first thank you. One night after a lovely night out at a friends having dinner I arrived home to find a package waiting for me. A Crafty Creatives box. I had been enjoying their boxes of crafty goodies for a few months and reluctantly had to cancel so I was surprised to see it. When I opened it this was the message I saw taped to the front. When I cancelled my subscription I joked on Twitter to Claire from Claireabellemakes that I bet the next box would be dots. The lovely Crafty Creatives ladies had obviously seen this tweet and yes the next box was dots! So they very kindly sent me the box as a gift with this little note. 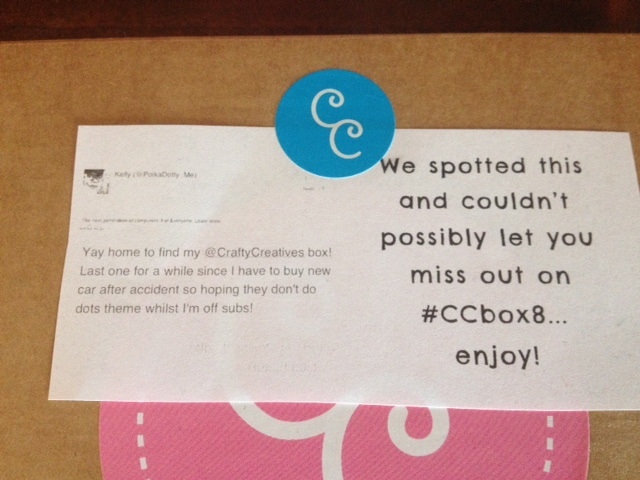 Now that is customer care and I want to thank you Crafty Creatives for your loveliness. 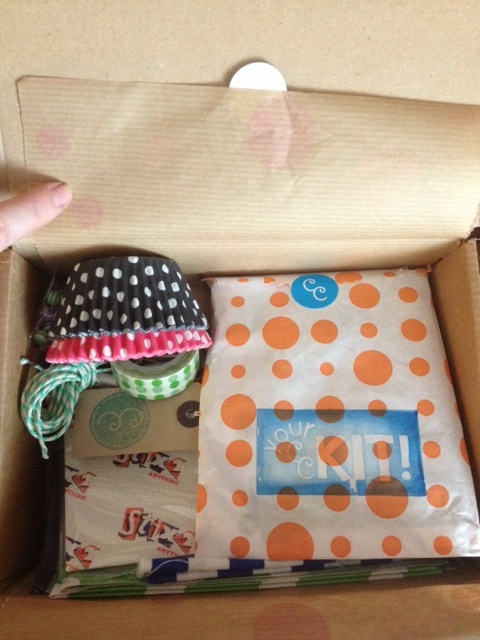 I cannot wait to renew my subscription, the boxes are packed with such lovely crafty goodies! My other notes of thanks are much quicker you will be pleased to know! 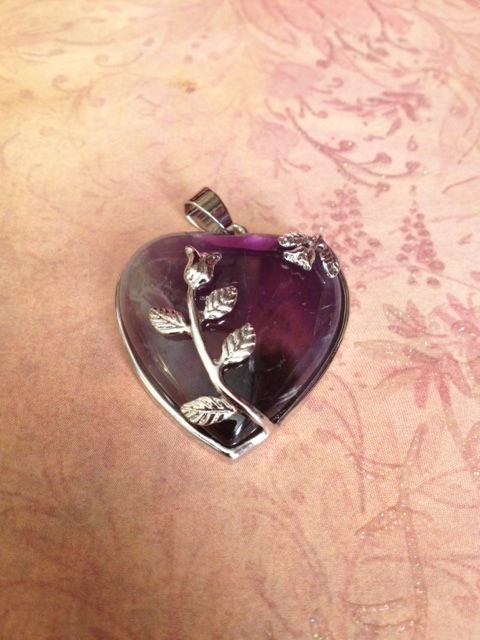 Firstly to Mum Dotty for this lovely necklace she got me as gift. It is so gorgeous and I will wear it with pride and as a reminder of how fab she is. Secondly thank you to Claire who got me this card. I loved how she prefaced it with ‘I know it’s not your birthday but…’ Yes you are seeing this right. Dots AND hamsters! There is some debate over whether it is a hamster or guinea pig but the label on the back says hamster and that is what we are going with! And finally thank you to family and friends, online and off who have listened to me going on about my crochet progress. ‘Yes!’ they must cheer when I post yet another picture of my crochet progress. Not. Actually this is the finally. Finally thank you to all those people who offered their showers whilst our landlady gets our bathroom refitted. We really appreciate your offers of help. So thank you for reading this snapshot of why I am grateful and want to say thank you to those around me. Does anyone keep a gratitude journal or list? Do you have a special notebook? A section in your Filofax? Keep it within your regular journal? Please share in the comments below and feel to leave a link to your own blog posts on the subject! This entry was posted in craft, crochet, Filofax, general, journal and tagged craft, crochet, filofax, general, journal on April 10, 2013 by MissDotty. Hello all! I am back to share the last few days of our Bath trip so without further ado here we go! We stayed in Bath until Friday afternoon and those last few days were spent wandering around Victoria Park, the Botanical Gardens, the Royal Crescent and the Roman Baths. I adore walking around the Cambridge University Botanical Gardens so it was interesting to walk around and compare. The above images are a snapshot of our adventures. Bath truly is a glorious city! I loved walking around the Roman Baths and found the experience enhanced by the very informative audio guide which was supplemented by a commentary by the fantastic Bill Bryson. I immediately wanted to reread all his books again! The experience was so well put together and even though there was a lot of information it was put together seamlessly with the aid of video reconstructions and the actual artefacts to look at. If you have never been I highly recommend it! We also went out for dinner at Panasia, greatly decorated and nice food but we were stung by the Valentine’s Day effect which meant it was packed and service took ages. We also went on the two open bus tours on offer, the city and the skyline tour. It was FREEZING but a really enjoyable way to see Bath. The wall coverings are from Coral Quay Fairtrade cafe where we feasted on a tasty cooked breakfast and admired the beautiful wall hangings. Here the service was again notably good and the cafe had a bright and airy atmosphere. The first of the small pictures depicts the gardens of the Herschel Museum of Astronomy. Mr Dotty, science nerd that he is, spent a happy what felt like hours looking at the equipment that Herschel himself used. The painting is of Queen Charlotte from our visit to the Holburne Museum and I fell in love with this painting. The colours were so vivid! Sadly our trip to Bath came to a close and we headed to our final hotel on the outskirts of Bristol, ready to travel to the Forest of Dean the next morning. Our final few days were spent visiting Mr Dotty’s gran and we were surprised by the sheep above as we travelled to hers on Saturday morning. Her cottage is in a rural location and as well as the sheep we were in for a shock when we came home after dinner to find a stag munching on the seeds on the bird table outside her door. It was such a thrilling sight and what a powerful animal! Our last meal of the holiday was amazing. We went to The Ugly Duckling and I knew immediately I would love the restaurant when they served us garlic popcorn. I have a bit of an addiction to salted popcorn and I cannot wait to try and make a garlic version! It was lovely to sit down with Mr Dotty’s grandma and catch up on her news. However all talk stopped when our main courses arrived, mine was a ‘Mediterranean Stuffed Chicken Breast Wrapped in Prosciutto Ham’ and was very tasty. Sadly I cannot seem to upload the picture of that meal so you will have to imagine its gorgeousness! 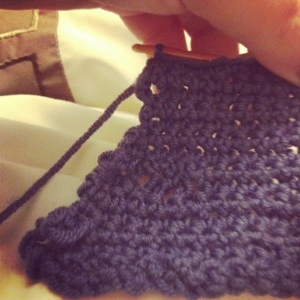 The remainder of the weekend was spent chilling out, reading and working on my crochet scarf. After all the walking we had done that week it was nice to sit down and relax! In fact the whole week was a wonderful chance to get to spend time with Mr Dotty and I am very grateful to him for our trip away. And so that is how we end this tale of our adventures to Bath! Thank you for reading and come back during week to see some of my crafty purchases whilst away. Take care! This entry was posted in craft, crochet, food, general and tagged Bath, craft, crochet, food, general on March 3, 2013 by MissDotty. Since January Mr Dotty and I have celebrated his 30th, my *cough* birthday and ten wonderful years together. We were also celebrating the Mr finishing his doctorate after a few years of madness. So Mr Dotty booked us a few days in Bath and then a few days visiting his Nan in the Forest of Dean. It was our first trip away together for a long time and it was the most wonderful time. Days spent wandering around Bath, hand in hand meant I came back feeling the most relaxed I have felt in a long time. In fact we didn’t want to come home! I have been waiting ages to write this blog post so I hope I remember everything! We left Tuesday afternoon and took turns in driving. 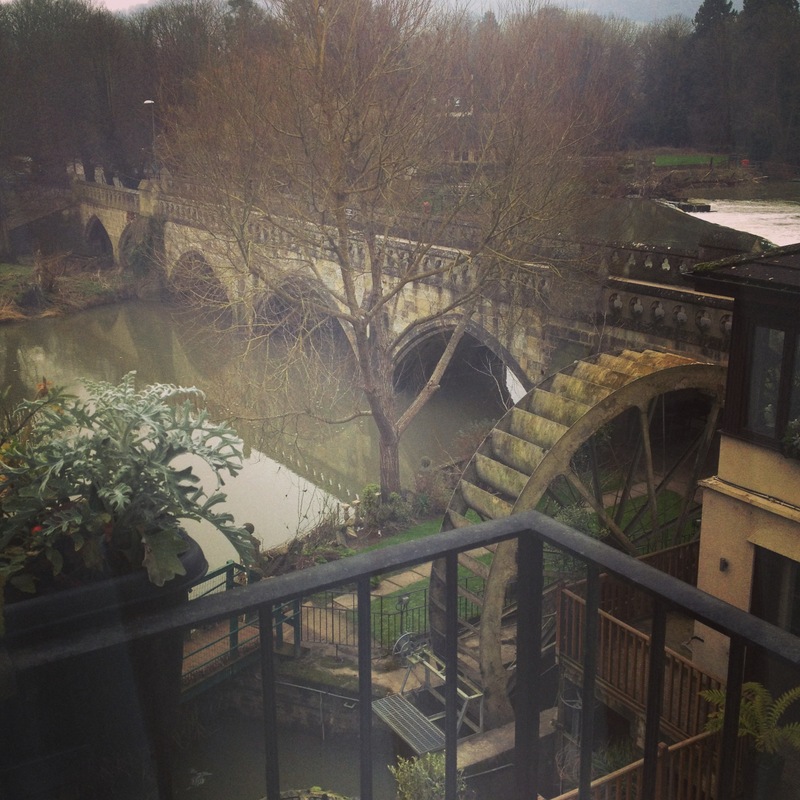 Our first night was spent in a hotel just outside Bath called ‘The Old Mill Hotel’ which was a nice hotel on the banks of the river. We arrived in darkness but woke up in the morning to the view below. We set off early the next morning into the centre of Bath to our second hotel of the week, the Hilton Bath City. We parked the car up for our stay and loved having our hotel right in the centre of everything. We dumped our bags and headed out for breakfast. By this point we were starving and headed into the first place we found, Bill’s. I have to say the service there was fantastic and really got our trip started off brilliantly! 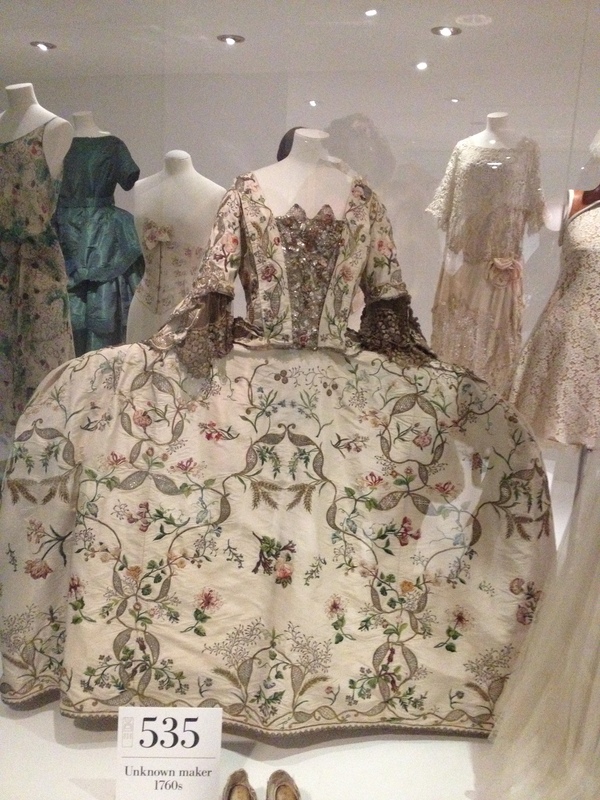 and this embroidered court mantua from the 1760s. Our trip continued with a visit to Bath Abbey. It was interesting to walk around but I particularly enjoyed looking at The Bath Abbey Diptychs which are presentation of the life of Christ by Sue Symons. 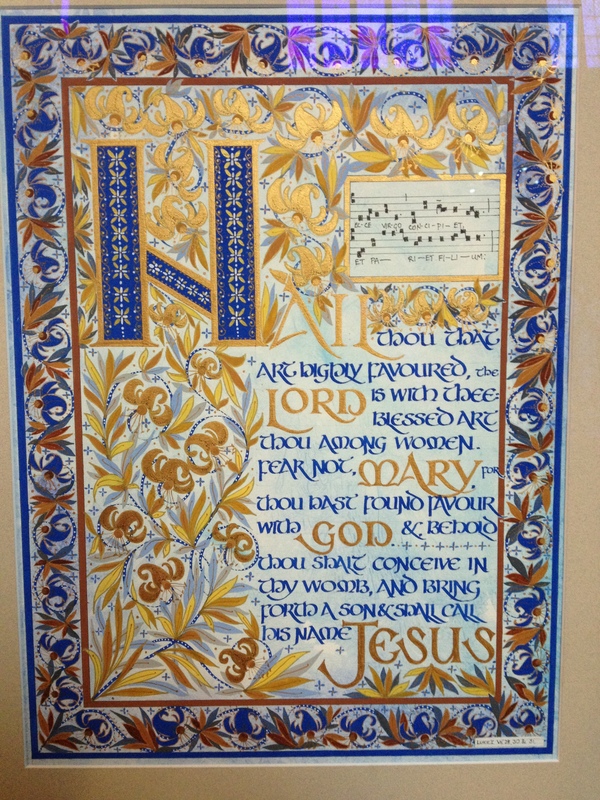 It was a mixture of lettering, decoration and needlework and I loved seeing how creativity like this can share a passion. No matter your beliefs it was something you could admire for its beauty. 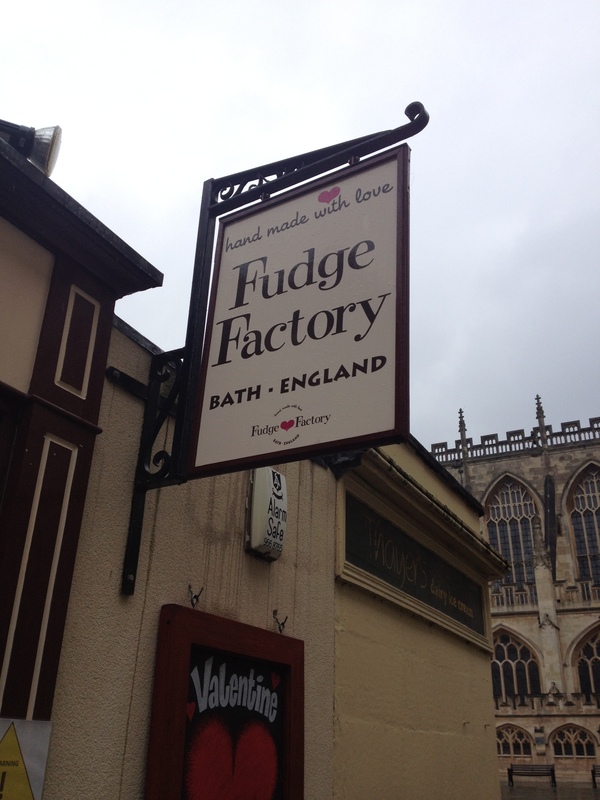 Further exploring continued with a visit to the Fudge Factory where I got some delicious honeycomb and violet cremes. Yum! After a rest in the hotel we headed out for dinner. We had passed Martini Ristorante several times during the day and the smells coming from it were divine so we chose this as our first dinner experience and my goodness did we make the right choice! They were quite busy so we were placed in their side dining area to begin with which was nice and private but it soon filled up! The staff were wonderful and we were very pleased with the service. 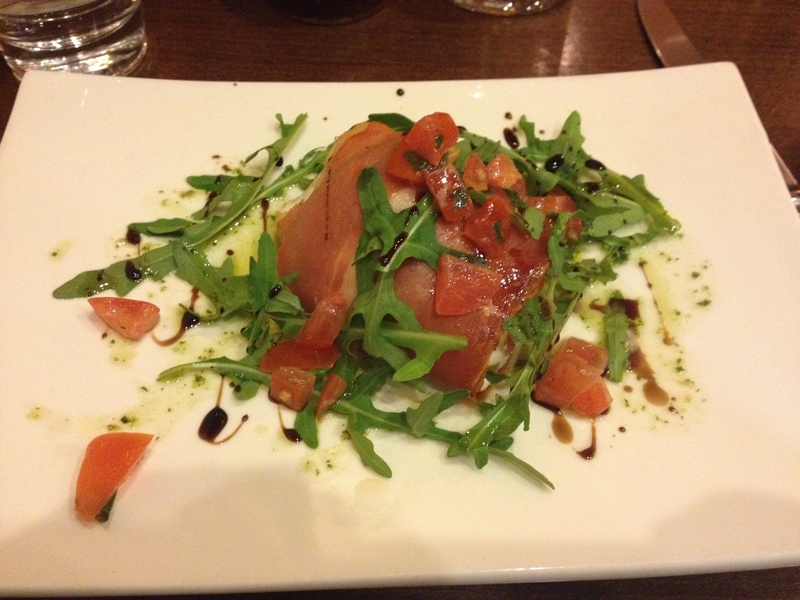 For starters I had Mozzarella Infornata, a dish of baked buffalo mozzarella wrapped in parma ham with balsamic vinegar. I could have quite easily eaten this for every meal that week! My main was Penne Toscana, Italian sausage simmered with vine tomatoes, red wine and rosemary. Again it was delicious and I will be aiming to recreate it home! Full and tired we spent some more time wandering and plotting our day the next day. Sadly we were disappointed with the bed that night as our bed was two singles pushed together, not what we expected and I woke up in the morning falling down the middle! Luckily we spoke to the hotel and they changed our room the next day but apart from that blip our first full day in Bath was wonderful! Come back tomorrow (laptop permitting) where I will share some more of our trip to Bath! Thanks for reading! p.s. sorry all photos were taken with my phone as I had lost my camera! This entry was posted in craft, food, general and tagged Bath, craft, general on March 2, 2013 by MissDotty. One of my failings as a crafty person is my failing at showing my finished projects on here and I marvel at those who share regularly! This is something I want to remedy in 2013 and so will be sharing a handmade book, some embroidery and my first crochet project over the next month or two! I am hoping this goal will help me stop adding to the ‘Work in Progress’ pile that I seem to be developing (and am rather ashamed of!) Over the past year I seem to have had no staying power for projects. 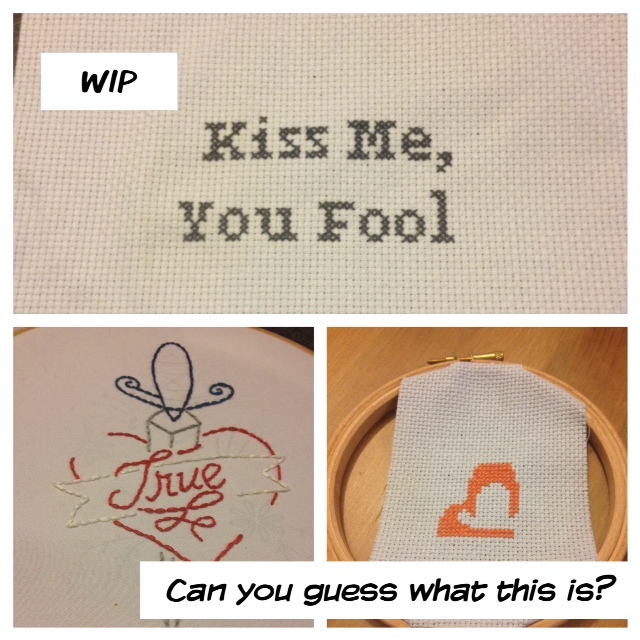 So here are a few glimpses of some my projects started but sadly still unfinished. Are you like me? Do you have many work in progress piles dotted around your house? Please share! This entry was posted in craft, crochet, sewing and tagged craft, crochet, sewing on February 11, 2013 by MissDotty. You know when you really, really want to do something but you can’t? Not because you aren’t allowed to but because you just can’t develop the skills. Well crochet and knitting is like that for me. My nan and one of my aunts are amazing knitters and my aunt worked as a seamstress for many years and is brilliant. I’m ok at embroidery and cross stitch and have yearnings for a sewing machine but crochet and knitting? Nope the skills bypassed me. My aunt has tried teaching me. My mum has tried teaching me. I have watched YouTube videos and read books but I just could not get it! I would see pins on Pinterest and pin them in the hope that one day I would be able to make these goodies. I gazed wistfully as friends sat there crocheting on a crafty evening and I envied the ladies at Cam City WI as they whipped out their creations. But still their skills did not come to be my osmosis. And then one day hope glimmered as I was told about crochet and knitting classes at The Sheep Shop (I think it may have been Claire but whoever it was thank you!). Armed with that knowledge I…well I put it off for ages thinking I would be rubbish and that I wouldn’t be able to do it. But finally I booked myself onto a class and eagerly awaited the beginning of February. Then a tweet from Joanne at Not So Granny alerted me to a cancellation so I very quickly asked if I could swap and I could! So yesterday I ventured to The Sheep Shop and with a lovely bunch of ladies I finally learnt the basics of crochet! I had the most wonderful few hours learning and the group was so small that Joanne could help us all when we needed it. She is a wonderfully patient teacher and allowed us time to consolidate and practice our newly learnt skills. If you have been thinking of doing a class like this but have put it off don’t! I am so pleased I did it and now I have the confidence and basics I feel like I can go off and learn some things on my own (even though I will be heading back for more courses to learn even more!). Now obviously it wasn’t it all glitter and sunshine. I came home and happily practiced and then had a complete mind blank. 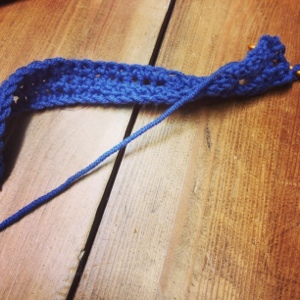 My double crochet was just not working! A panic followed and then a quick glance on YouTube showed me what I was doing wrong! My next problem was well…you will see at the end of the post! 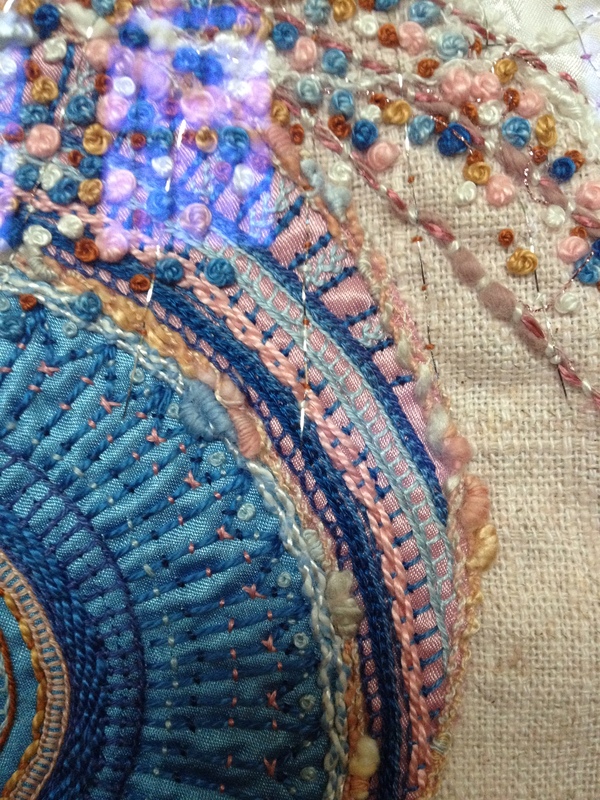 But again I have had advice from lovely Internet people and I’m going to start again on a piece this afternoon. I am going to set aside some practice time every day (I am itching to do some now but I must do some work first, then play!) and hopefully soon I will be able to make more than just lovely long strips that are collecting around the bungalow! It’s made me excited to try different crafts as well so at the moment I’m feeling very excited! I will update you with my progress and things I make. Have you learnt a new skill recently or tried a new craft? Is there something you really want to learn? Please share in the comments below! Eek something goes wrong at home! 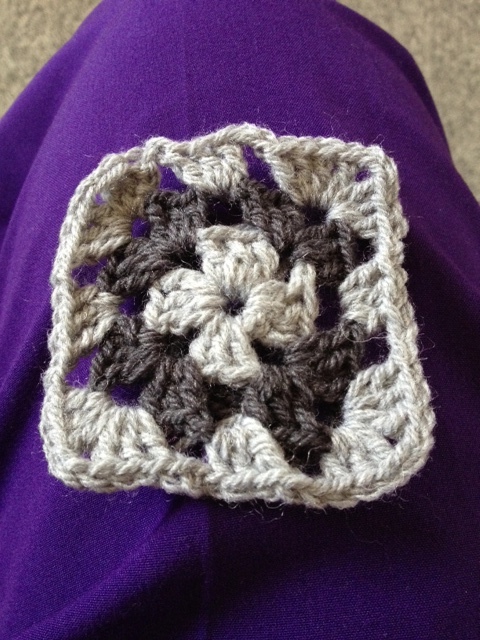 This entry was posted in craft, crochet, Uncategorized and tagged craft, crochet on January 20, 2013 by MissDotty. I will be honest. I am not really a big Christmas person for a variety of reasons. I can be a bit humbug if truth be told. 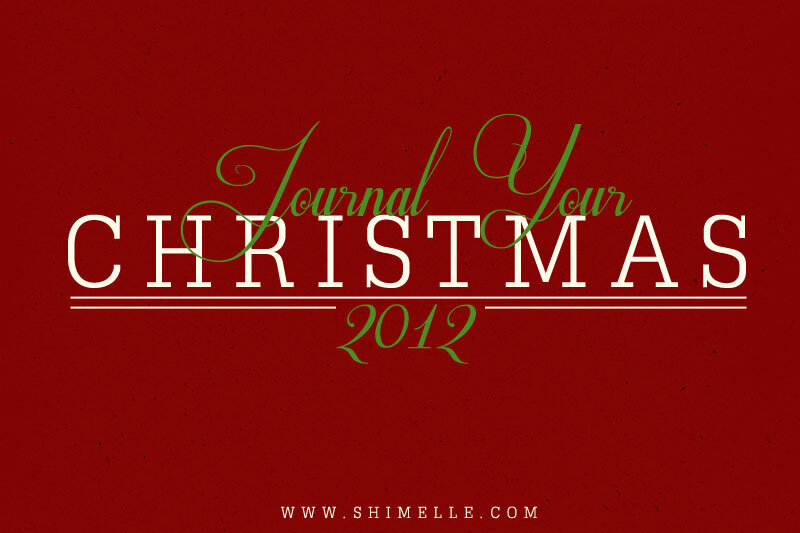 But every year I try and be different and part of that comes through having a go at Shimelle’s Journal Your Christmas. I do love Shimelle’s classes and although I am not always as successful as I would like I do try. This year I feel different about Christmas, more positive. Maybe it is to do with being involved in Cam City WI preparations or even seeing blog posts filled with Christmas ideas, I really don’t know. What I do know is I have a teeny tiny glimmer of excitement and this means I feel this is my year to complete Journal your Christmas AND keep a record on here. Double whammy! 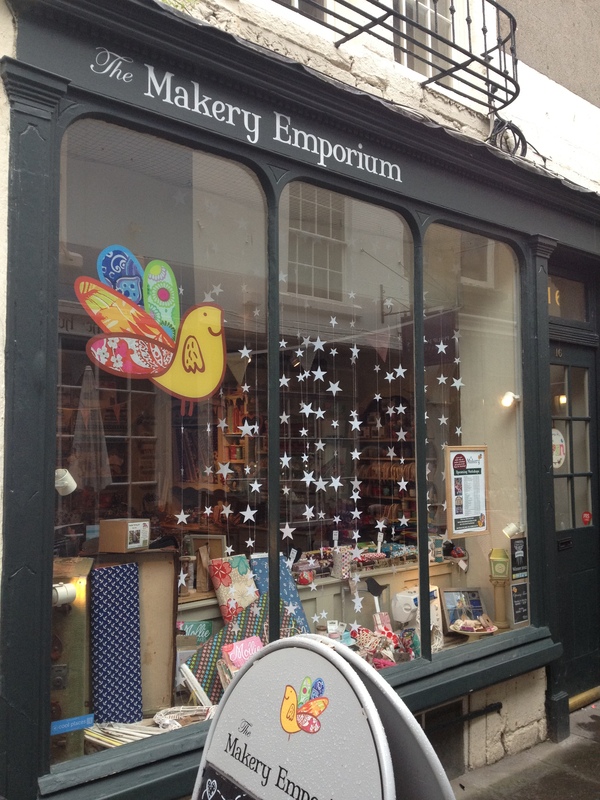 So without further ado I declare Miss Dotty’s Journal your Christmas open! Woohoo! Let the planning commence! Have you taken part in Shimelle’s project before or anything similar? If so please share links below, I would love to have a look! This entry was posted in craft, journal, smash book and tagged craft, journal, smashbook on November 26, 2012 by MissDotty. and I have to say it was a wonderful way to spend some time. 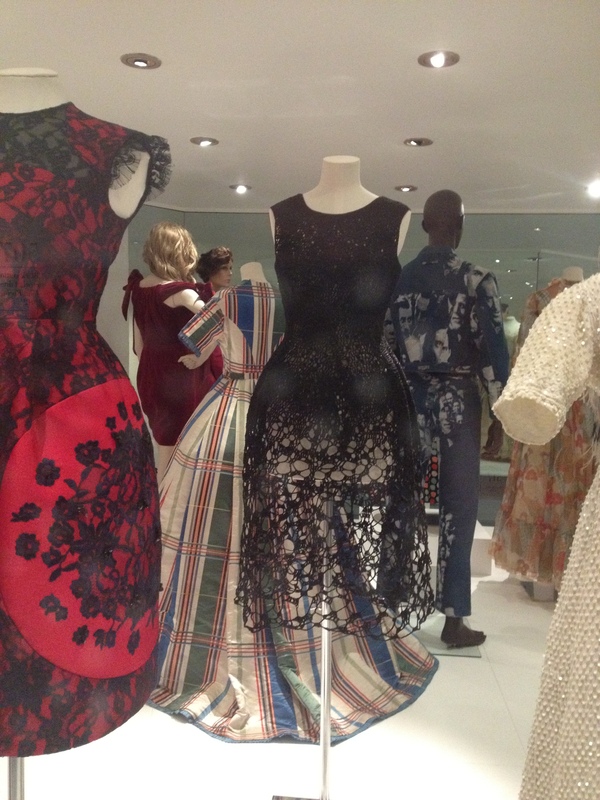 Even Mr Dotty enjoyed it and we were both amazed by the quality and loveliness of everything we saw. I was dazzled by fabrics and jewellery but being the paper geek I am I stuck to paper related items (and coffee and cake obviously!). If you have a Made-It Market near you and you haven’t been yet I suggest you go! Ok so on to my pretty purchases! The pencil roll will be great for mobile journaling once I have swapped the pencils for pens. I cannot for the life of me remember which stall this was from so if anyone recognises it please let me know! The stack of books card is from Nic Farell Illustration and is absolutely beautiful. I am afraid no one else is getting this, it is going in my smash book for me to stroke and everyone else to see when they go through it! It is the same with the bottom right card and yes I know I have a problem with both cards and book related items. 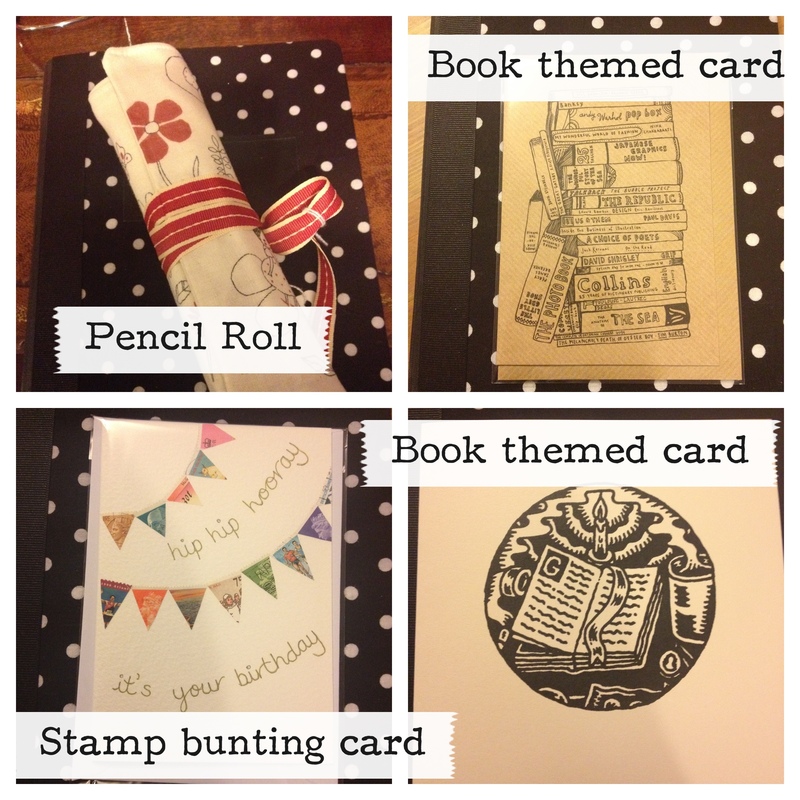 Lastly the stamp bunting card. 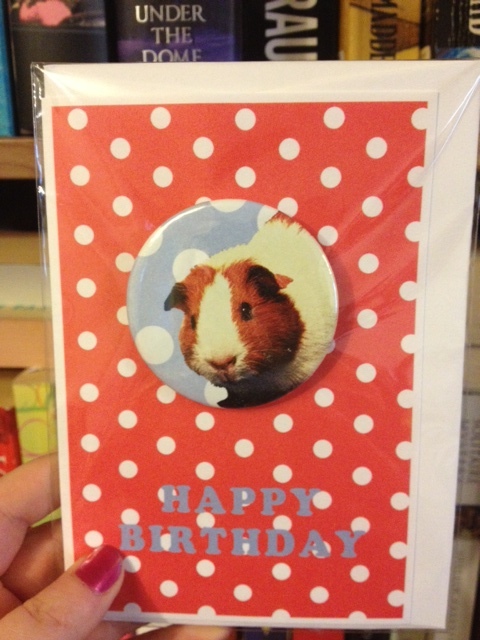 I would have missed this if it wasn’t for the lovely Claire from Claireabellemakes who pointed it out to me. As a snail mail lover I really wanted it for myself so I am afraid I asked Mr Dotty to get it for me for my birthday card from him. Naughty I know but needs must! The gent he is he agreed! This came from the lovely Jenny from Two Tone Green who sadly doesn’t seem to have a website but I have her phone number if anyone really wants their own! She had the most delightful selection of cards and I will be looking out for her at other crafty events around the area! Finally I got a lovely sewing kit from Clare from Boo’s Attic, a fellow @CamCityWI committee member. Not for the first time I wished I was a knitter so I could buy some of her lovely hand dyed yarns. Swoon! So all in all it was a morning of swooning. I could have got a lot more but knowing later that day I would be paying to get my little sick car fixed I had to restrain myself! Have you got any craft goodies lately? Where did you get them? Please share! This entry was posted in craft, general, journal, letters and tagged craft, journal, letters, paper, smailmail on November 25, 2012 by MissDotty.